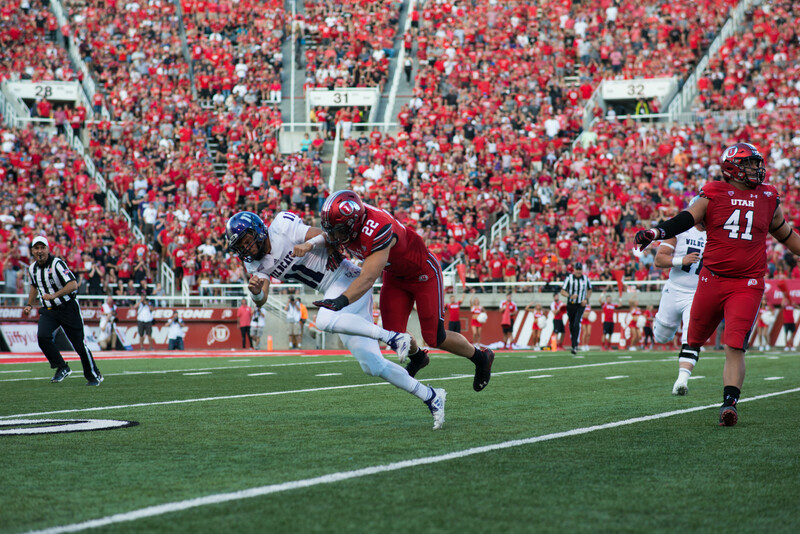 Weber State University’s Mike Hoke rolls out of the pocket in front of a packed stadium during WSU’s 35-21 loss to McNeese State University on Saturday. 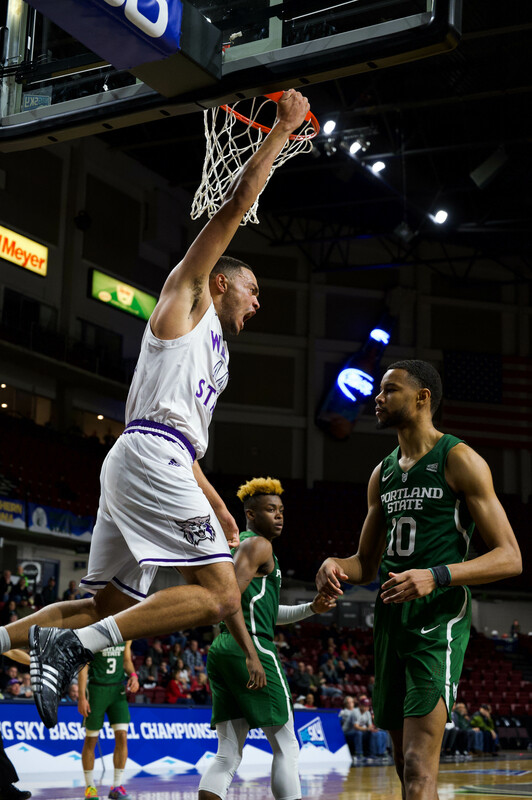 The Wildcats fell to 0-3 on the season, and will remain at home next week when they host Eastern Washington University in the first Big Sky Conference game of the season. After two losses on the road, Weber State University opened its football season at home on Saturday night, falling for the third-straight week, this time at the hands of McNeese State University. The Cowboys, who are ranked 19th in the nation, dominated much of the game and ran away with a 35-21 win. WSU quarterback Mike Hoke said the team was plagued by mistakes and errors, which hurt their chances to score throughout the game. On the Cowboys’ first drive, the Wildcats’ defense held strong, forcing MSU to attempt a 50-yard field goal. The attempt was no good. WSU took over on the 32-yard line, but was unable to move the ball, and Tony Epperson came on to punt for the second time. His punt rolled out of bounds at MSU’s 15-yard line. The Cowboys had their second scoring chance of the game early in the second quarter. MSU took over in good field position after the Wildcats were forced to punt from their own one-yard line. Then the Cowboys were aided by a pass-interference call. The call drew heavy boos from the crowd. After an MSU missed field goal, Kris Parham got the ball on a handoff and took off down the left side of the field. Parham was hit and the ball popped loose, only to be caught by Parham, who continued for a few more yards on his run. The Wildcats struggled offensively throughout the half and weren’t able to seriously threaten the Cowboys. WSU was forced to punt four times in the first half. Epperson once again looked strong as the Wildcat punter. He kicked two 71-yard punts on the night and finished with an average of 55 yards per punt, a WSU record. WSU Head Coach Jody Sears said the team needs to learn to execute well on every play. After two missed field goals, the Cowboys were able to score late in the second quarter. After moving the ball deep into WSU territory, Darius Carey found the end zone on a six-yard run up the middle. With four minutes left, the Cowboys drove 80 yards and scored their second touchdown of the game. This time, quarterback Cody Stroud ran it into the end zone from the seven-yard line on a broken play to give MSU a 14-0 lead at the half. The Wildcats started strong defensively in the second half, sacking Stroud to bring up third and 19 on the Cowboys’ first possession of the half, and forced MSU to punt. C.J. Tuckett got WSU into the Cowboys’ red zone for the first time of the night, rushing down the right side to MSU’s 20-yard line. Shaydon Kehano scored the first points of the game for the Wildcats, catching a short pass from Hoke and getting into the end zone to cut the Cowboy lead in half with 11:25 left in the third quarter. Following the WSU touchdown, a hectic segment of play saw back-to-back turnovers and a touchdown scored. First the Wildcats recovered a fumble, with Danny Mullarkey recovering a fumble on MSU’s 26. On WSU’s first play, Hoke was intercepted on MSU’s four-yard line. On the next play, MSU scored on a 91-yard end around to push its lead back to 14 points. Hoke said the touchdown gave the momentum back to the Cowboys. Things went from bad to worse for WSU late in the fourth quarter, when Kehano left the game with an injury. He went down after taking the ball to MSU’s five-yard line and had to be helped off the field. He was unable to put any pressure on his right leg when leaving the field. Jordan Adamczyk came into the game in the fourth quarter and led WSU to two late touchdowns to cut the final score to 35-21. The Wildcats fell to 0-3 following the loss, while MSU improved to 3-0. Next week, WSU will open Big Sky play when it hosts Eastern Washington University in the homecoming game.